Ultimately New York's Benziger Bros. derived from Joseph Charles Benziger (born Einsiedeln, Switzerland, 1762; died there 1841). His business started modestly as a dealer in religious articles, then as a bookseller. In 1833, two sons succeeded their father. These were Charles Benziger (1799-1873) and Nicholas Benziger (1808-1864). They expanded the business from book publishing to include printing religious pictures. According to the Catholic Encyclopedia, 1907, Nicholas Benziger was primarily responsible for opening a branch of the business in New York City in 1853. In 1860 Charles & Nicholas Benziger retired and they were succeeded by no less than six of their offspring. This third generation in the business were three sons of Charles Benziger (Charles, Martin, and J. N. Adelrich) and three sons of Nicholas Benziger (Nicholas, Adelrich, and Louis). Quoting the Catholic Encyclopedia, "The house of Benziger Brothers in the United States was established in New York in 1853 by the Swiss house, but its development as a publishing house did not begin until 1860 when J. N. Adelrich Benziger (d. 1878) and Louis Benziger (d. 1896) took charge. In 1860, a house was opened in Cincinnati and in 1887 one in Chicago." The earliest Benziger entry in New York city directories occurs in Rode's New York City Directory, 1854-55, where "Benziger & Meyer, bookstore" is listed at 333 Houston St. This business seems to have been a partnership between Nicholas Benziger and Louis Meyer. Benziger & Meyer ran from 1854 to 1856, and then was replaced by "Benziger Brothers, publishers" at 172 William St. in the Trow directory for 1857. The brothers were Adelrich Benziger and Nicholas Benziger. That J. N. Adelrich Benziger and Louis Benziger took charge in 1860 is reflected in the 1862 Trow directory, when Benziger Bros. (now located at 150 William St.) was made up of Adelrich Benziger and Louis Benziger. Louis Benziger (1840-1896), age 30, born Switzerland, bookseller, appears in the 1870 U. S. Census, living at 109 W. 44th St. His first name is recorded only as "L.," as is that of his wife and 9-month-old son. In 1871 Louis Benziger applied for a passport where he declared that he was born in Switzerland 28 May 1840. He produced a certificate of naturalization from the Superior Court of New York City dated 14 Oct. 1868. In 1880 the U. S. Census recorded him living at 368 3rd Ave., Staten Island. He was 40 years old and lived with his wife, Louisa, age 38, two sons, Louis 11 and Bruno 6, and a daughter, Lucille, age 5. On his death in 1896 the New York Times, 14 April 1896, reported, "Louis Benziger, who died Sunday at his home, in New-Brighton, S. I., was born at Einsiedeln, Switzerland, May 29, 1840. He came to this country in 1860, and at once took an active part in the established business of Benziger Brothers. He assumed charge in 1878 of the publishing department, then a comparatively small business, and by his judgement, energy, and liberality, increased it to such an extent that at the time of his retirement, in December, 1894, he left it the leading Catholic publishing house in the country. He was a liberal contributor to all Catholic charities, and it was mainly by his exertions that the Leo House, that haven of German Catholic emigrants, was established. His generosity was not restricted to those of his own faith. Careful and exact in business, he was open-handed and hospitable to his friends, and those who knew him intimately know how great and tender was his heart. Eminently domestic in his tastes, his time was spent with his family. He leaves a wife, two daughters, and two sons, one of the latter succeeding him in business. The funeral will be from St. Peter's Catholic Church, at New-Brighton, and the burial will be in the Catholic cemetery of that place." Both Louis Benziger and J. N. Adelrich Benziger (1837?-1878) were recorded in Civil War Draft records, June 1863. They lived at that time at 305 Race St. in Cincinnati, Ohio. J. N. A. Benziger was 26 years old and Louis was 23. Both were unmarried. In Oct. 1864, J. N. A. Benziger, of 51 St. Marks Place, New York City, was assessed a tax of $162.50 on his income of $3250. His son, Adelrich Benziger, applying for an emergency passport in Seoul, Korea, in 1919, said that his father, Joseph Nicholas Adelrich Benziger, born Einseideln, Canton Schwyz, Switzerland, emigrated to the U. S. about 1856 and lived 22 years from 1856 to 1878 in New York City mostly. On his death in Feb. 1878 Publishers' Weekly had the following notice, "Mr. J. N. Adelrich Benziger, one of the most enterprising and prominent Catholic publishers in the United States, died on the 17th inst., at the age of 41. Mr. Benziger came to this country in 1859, and establshed the western branch of Benziger Brothers, at Cincinnati, which owes its present prosperity to his indefatigable labors and business skill. In 1869 he returned to Europe, where he married the Countess Sarnthin, and returned with her to New York. In 1870 he transferred the bindery and lithographing branches of the firm from Cincinnati to this city, and from that time up to his death was the leading spirit of the New York house. Mr. Benziger leaves a wife and three small children." Benziger's Brooklyn factory on De Kalb Ave. dates from 1895. They occupied the building until 1961. The last entry for Benziger Bros. in the New York telephone directory was in 1968, when they were located at 7 E. 51st St. 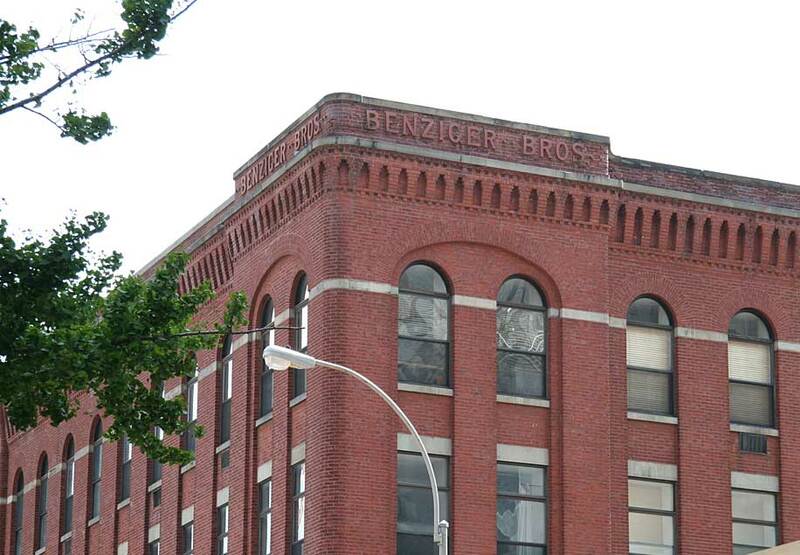 In 1968 Benziger Bros. were acquired by the publishers Crowell Collier Macmillan. This very simple ad for Benziger Bros. at 311 Broadway in 1877 presented them as REGALIA makers. This ad from the 1897 shows three locations and the dates of establishment of Benziger Bros. in New York, Cincinnati and Chicago. It also mentions the Brooklyn factory on De Kalb Ave., corner of Rockwell Place. This ad from 1922 lists the Benziger Bros. locations in the same three cities.